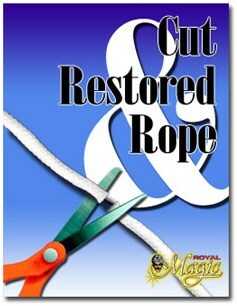 The Cut And Restored Rope is one of the best-known feats in all of conjuring. Magic doesn't get much more direct than this: The magician shows a length of unprepared rope and folds it in half. With a pair of sharp scissors, the rope is cut in half. The magician ties the two pieces of rope together. Without any fishy moves, fumbling, or complicated sleight of hand, the rope is then instantly restored! Comes complete with magicians rope, bonus tricks and methods, and each unit is poly-bagged with a header card for easy display.